I’ve been on a quest to make the perfect homemade granola bar for years. I’ve tried lots of recipes and I’ve also tried to create my own recipe from scratch. Baked, unbaked, crunchy, chewy…they’ve certainly all been edible, and some have been good enough to make a second time, but I haven’t found The One. I want a granola bar that doesn’t rely on a lot of added sugar to taste good, that can handle some variation of ingredients, and stays together, for the love. It’s a bummer to cut into your pan of granola “bars” and watch them turn into crumbs before your eyes (or fall to pieces after knocking around in a lunch bag). 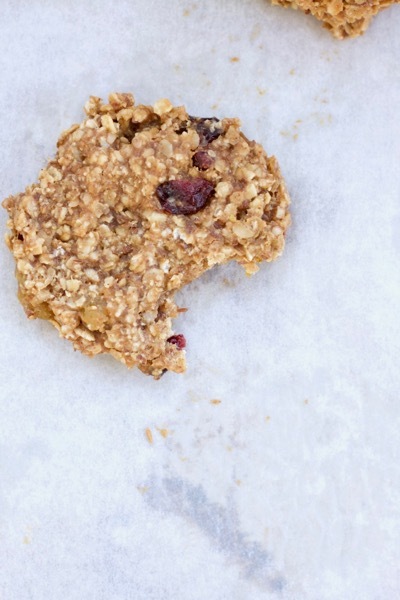 I have yet to find this ultimate granola bar – but then I tried these breakfast cookies from Sally’s Baking Addiction, and the search suddenly seemed much less important. They’re sweetened with just 1/4 cup of honey (or maple syrup) in a batch of more than a dozen, you can substitute lots of the ingredients to change them up, and the round shape stays together perfectly and even travels well. 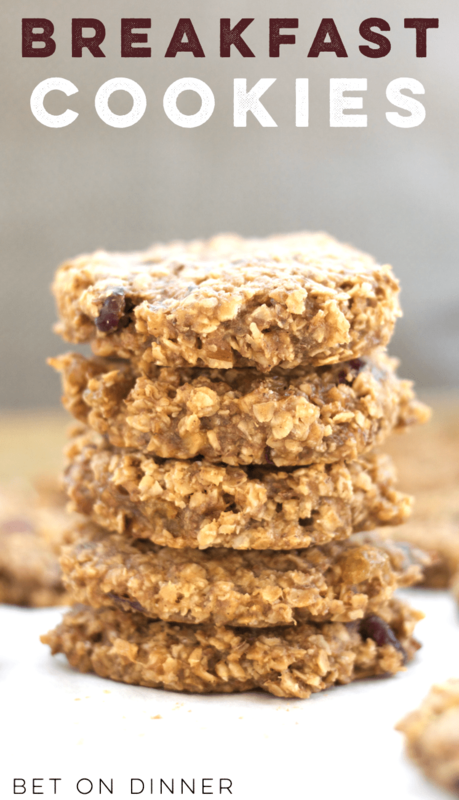 Plus – they taste so good, and are the best parts of trail mix and granola held together in a dense and chewy cookie. I’ve made the version I’m detailing here at least 5 times: chopped pecans or almonds, raisins, and cranberries, with almond butter and honey. According to Sally, the recipe is extremely flexible, though – dare I suggest a chopped peanuts, chocolate chips, and peanut butter/maple syrup version? Drool. I use a 1/4-cup measuring cup to portion out the dough. I usually get 15 cookies out of a batch, but my helper today was rather ravenous, so we ended up with 14 somehow. I’m out of parchment paper, but I recommend using it! The cookies won’t spread, so flatten them down a bit after you scoop them. They bake until they’re just toasty on the edges, and are the perfect running-out-the-door breakfast or filling, energizing snack! I’m not usually a calorie-counter, but I ran the numbers on these out of curiosity. They’re very similar in calories and nutrient breakdown (fat, carbs, and protein) to KIND bars or Lara bars, which are store-bought bars we like (but at around $5 for a box of 4, we can’t afford to eat those every day!). Give these a try for a healthy, easy alternative – and holler at me if you have a granola bar recipe for me to try! Preheat the oven to 325. In a large bowl, combine the oats, salt, cinnamon, almond butter, honey, applesauce, mashed banana, and mix-ins (see notes below) and mix well. Scoop dough onto a parchment-lined baking sheet using a 1/4 cup measuring cup. Flatten the cookies slightly (they don’t spread so they’ll be whatever size and shape you make them at this point). Bake for 15-16 minutes until they are beginning to brown at the edges. Cool on cookie sheets and store at room temperature for up to a week, or freeze indefinitely! I love this mix-in combination, but feel free to play around with it! The total quantity should be about 1.5 cups or less, but use whatever dried fruit, nuts, seeds, ahem chocolate, etc. that you like! I have used both applesauce and apple butter and I like both – the apple butter makes the cookies slightly sweeter and you get hints of spiciness. With applesauce, the cookie is a little blander but that just lets your chosen mix-ins shine! I suspect you could also use an additional half of a banana. Adapted slightly from Sally’s Baking Addiction – see the link for her favorite mix-in combination! Jay's Steel Cut Oats (the perfect make-ahead breakfast). Will be trying for sure. I make granola all the time for cereal, but this sounds yum to change it up. And for snacking. Thanks! P.s. We make Nana’s potato soup all the time! Thanks Bet! Just got some out of the oven and they are delicious! (I couldn’t wait for the cooling process 🙂 I threw in what I had in the pantry… walnuts, cranberries, choc chips, and flaked unsweetened coconut. I’m excited to try some different combinations! Keep em coming! have you ever tried them without the banana? I LOVE the idea of the breakfast cookies, I’m just not crazy about banna in things. Do you have any more detail on the freezing option? I have no experience freezing cookies. If I want to keep these on hand for breakfast during the week, would I just pull one out the night before and thaw it? Or thaw a batch for the week? Anna, I put them in a freezer bag in a single layer and freeze them that way so I can just pull out one at a time (a tupperware with waxed paper between the layers would work too). You can thaw as many as you want overnight, or even defrost them on low power in the microwave in the morning! I think you could thaw a week’s worth, too – whichever is easier for you! Thanks for the link, Lindsay! 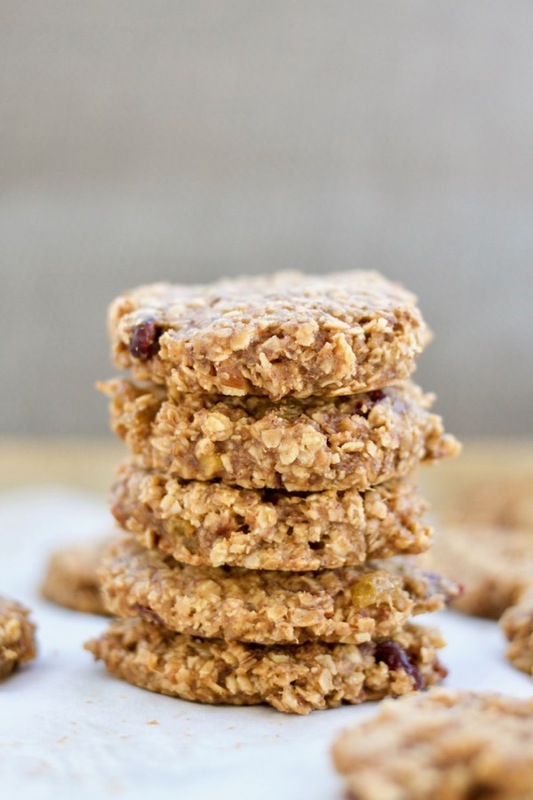 It came at the perfect time because my 3-yr-old is bringing “special snack” to preschool this week and I had thought I would make some (mini) breakfast cookies – forgetting I need to send something nut-free! I have all the stuff for those bars and am totally trying them!! Yeah, these are great. Yum!! The preschool teachers were raving about them, too! :o) Definitely going to make these again and try some other combinations! Thanks Lindsay! I just made these- yum! I’m trying to cut out added sugar and I think these will help satisfy sweet cravings! I’m so glad you like them! I think I need a batch for this week now. 🙂 And way to go on cutting out the sugar! These look good, BUT…my husband won’t eat bananas no way, no shape or form! (Not even my delicious banana bread or banana ice cream!) What can I substitute for the banana? I doubt the recipe would turn out the same by just leaving it out.